M-Audio Q40: the headphones you can mix with? 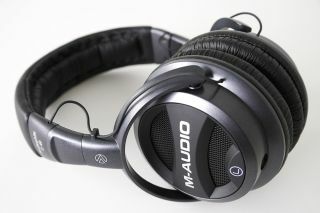 M-Audio has launched its first pair of closed-back studio headphones in the shape of the Studiophile Q40. These cans feature extra-large (40mm) drivers that are designed to deliver superior low-frequency extension. Mixing on headphones has traditionally been seen as a bad idea, but M-Audio claims that the Q40 "closely emulates" the experience of using full-size reference monitors. We're also led to believe that these headphones are comfortable to wear for long periods and that they provide excellent sound isolation. The new 'phones come with a 3-metre detachable cable that has 1/8-inch plugs on each end (a 1/4-inch to 1/8-inch adapter is also supplied). The Studiophile Q40 headphones are available now priced at $180/£109. You can find full specs on the M-Audio website.